Salesforce integration not working properly? Can you please let us know what exactly it's not working for you with Salesforce integration so we can check further and assist you? Hi, I am trying to get our "Cerasis General Contact Form" to integrate into SalesForce and to map to Leads in Salesforce. It doesn't seem to populate in Salesforce and now I am not even getting my emails I set to get as a notifier. I noticed on the form that most of the Textbox fiedls you used and mapped to Salesforece were hidden fields. The hidden field's value being cleared upon from submit must be loosing its value so it could not transfer the value to the integration. #2 Do a re-integration process. 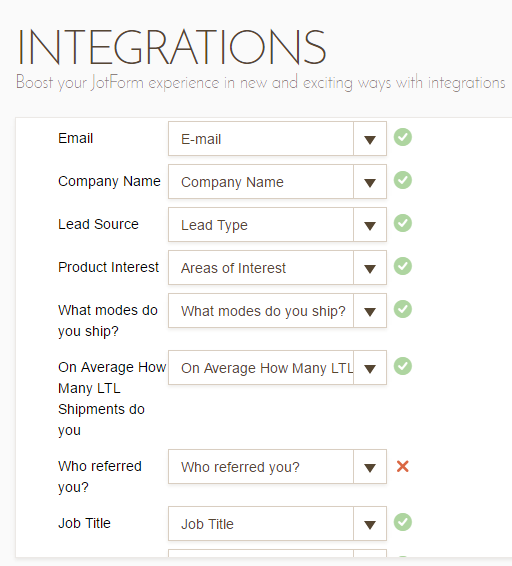 That is remove the Salesforce integration - Save the Form and then add integration again. Make sure that all credentials and the appropriate Salesforce list is being used in the integration. 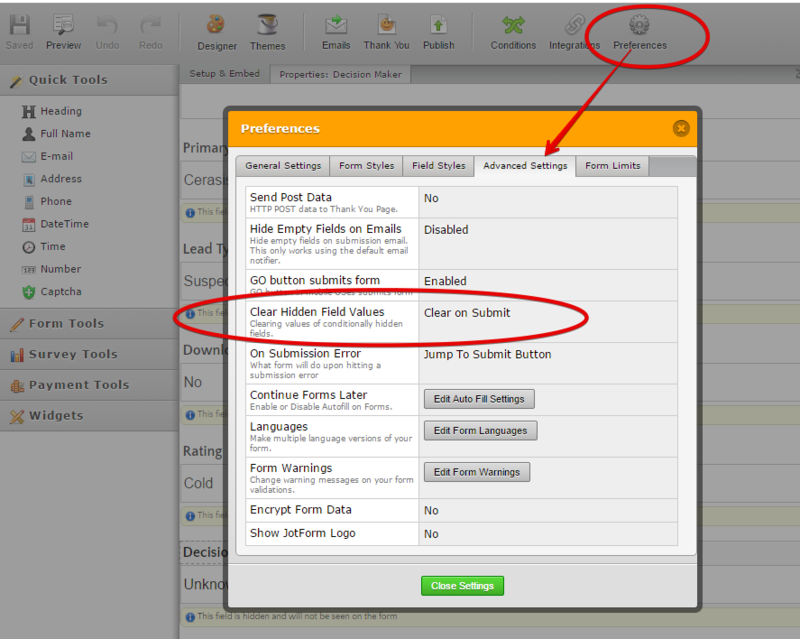 After doing this 2 changes, save the form and observe if new submissions will now populate your list in Salesforce. Let us know if this did not make any difference. I did this and still no synced lead. How long should the sync process take? I am still not getting my email notification. May I ask if your form https://www.jotformpro.com/form/30495793299976 had ever worked with Salesforce integration before and it just suddenly stop working? I see the form have multiple submission data already, I want to find out first if those previous submissions have successfully been send as leads to your Salesforce list. We will attend to it shortly. No, because we just launched SalesForce. I am trying to get this to work for the first time, successfully. The LTL Guide e-book form works SOMETIMES. 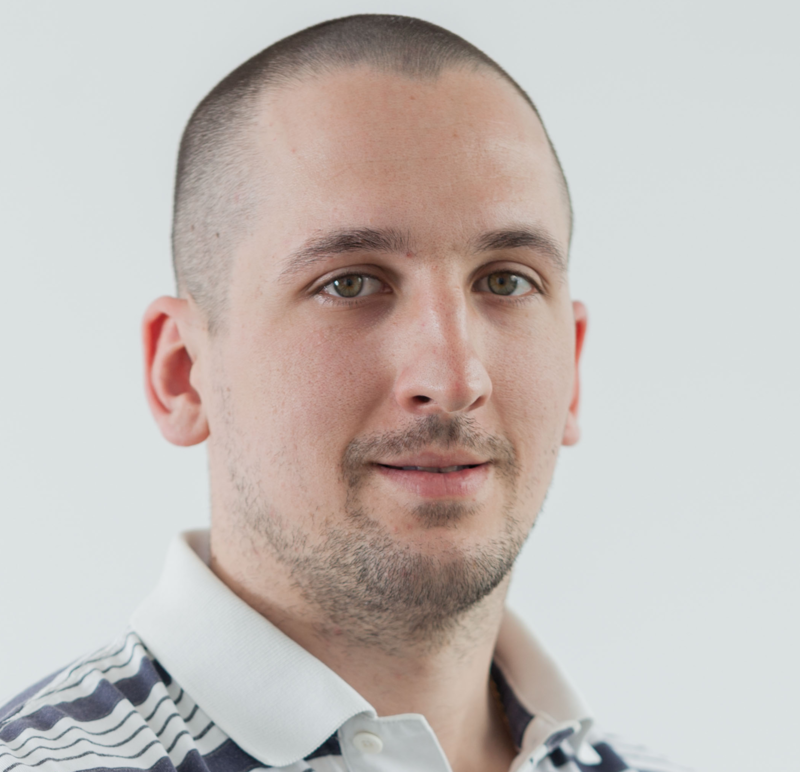 It seems to work when someone picks that they don't ship LTL or Small package, which have conditionals on them. It doesn't work when someone does select those. OK, i've got the LTL Guide e-book form isolated to only NOT work when you select that you ship LTL and fill out how many per week. It won't show up in SalesForce. If you do NOT pick that, it works just fine. I'm testing out the Salesforce integration by cloning your form. Please allow me some time to check on this and get back to you with my findings. I've tried integrating with Salesforce using the cloned form and I was able to sync the form data with the lead in Salesforce. I've created some custom fields in Salesforce lead to match the fields on your form. Please see the screenshots below with the fields matched and the lead sent to Salesforce. As I check your JotForm from your account now, I don't see any active integration with Salesforce. If you have removed the integration could you try integrating Salesforce again and let us know if you need any further assistance. Can you take a look at the LTL Guide e-book one? that is integrated to sales force, and works except for when someone chooses LTL as their mode shipped. OK. 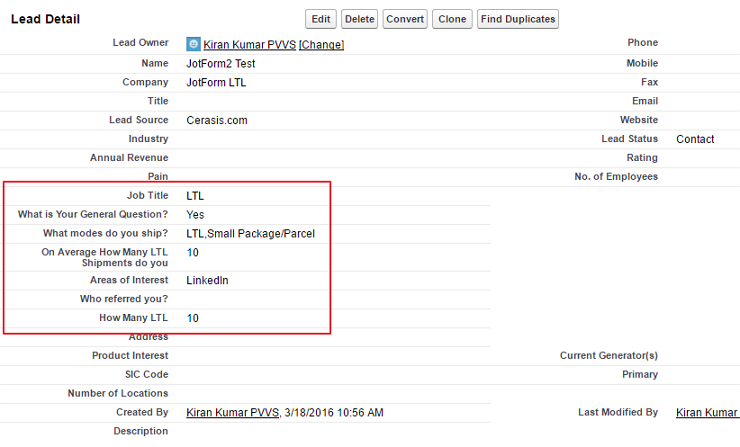 So I did the salesforce integration on my form and still, did not work if I select LTL on Cerasis General Contact Form. If i DON'T select LTL, it works fine. Why? Should I clone the form and use the new one? OK, just cloned and then redid integration AND STILL if I choose LTL it DOES NOT pass thru to SalesForce. Why is that? I don't understand why THAT doesn't work. If you don't mind please allow us some time to try to investigate this problem more in-depth for you and we will get back to you about it as soon as we can. I've tried cloning the form LTL Guide e-book to my account and integrated Salesforce to it. As I submit the form, I'm able to get the from data to Salesforce without any issue along with the custom fields data. 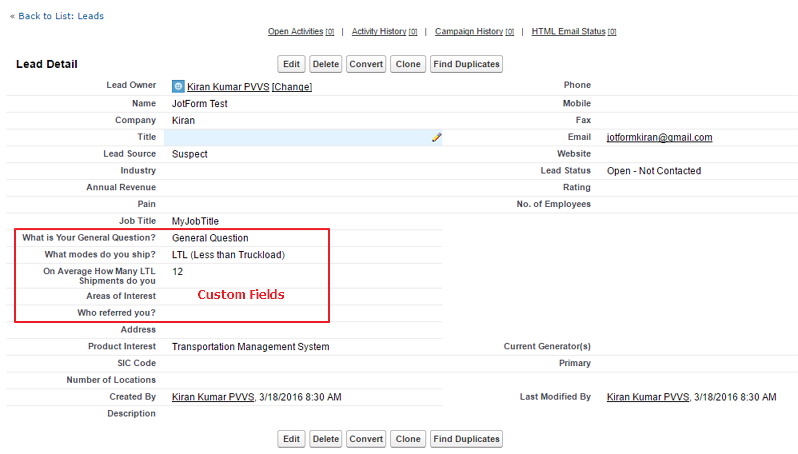 I've checked your JotForm and see that the fields are properly mapped with the Salesforce fields with reference the titles shown in the integration. Since there are custom fields, we request you to check the type of the custom fields to match with the form field types and please make sure that there are no changes made to field names or API Names that would break the integration. Hope this information helps! If you need any further assistance, please let us know. We will be happy to help. Would it help if I gave you my salesforce login to check? Thank you for your suggestion, but since this is an open thread could you please check, like my colleague suggested, if the type of custom fields match the form fields type. I checked your form as well and I saw that all mappings are ok. So I assume that maybe mismatch in field type or name could cause this problem. We're sorry that this problem still persists but we are doing our best to solve it as soon as possible.